Auctions offer buyers a convenient way to find useful and fun items at good prices. From real estate and vehicles to medical equipment and collectibles, buyers are turning to auctions as an excellent source for things they want and need. Winning an item can be fun and gratifying but auctions involve legally binding commitments so buyers should have a full understanding of the process before participating. Here are some things a bidder should understand before jumping into an auction. What is the Auction Method of Sale? 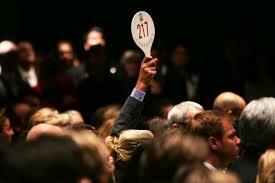 An auction is a type of public sale involving a seller and more than one potential buyer. Prospective buyers engage in competitive bidding for real estate, personal property, and business property. In an absolute auction, the highest bidder wins the item. There is no minimum price (reserve) and the seller is not permitted to bid. In contrast, the seller in a reserve auction sets a minimum price (the reserve). The final bid wins the auction if it meets or exceeds the reserve price. Auction companies seek to sell items for as high a price as possible. They’re in business to make money. But auctioneers also represent sellers and owe them certain legal obligations. The auction company also must protect bidders with fair competition for the property being auctioned. Most auctioneers are professional and honest. They stay abreast of best practices and the law through various channels including National Auctioneers Association (NAA) training, reading articles and blogs on auction law, and conferring with other auctioneers through the NAA or various networks. They conduct fair auctions. But sometimes an auctioneer engages in practices that violate these standards. By researching the auction business and reading blogs like this, bidders can learn to recognize and differentiate between dishonest auction practices and honest practices that work to their disadvantage or, at least on the surface, seem questionable. A bidder who has concerns about the bidding process should discuss them with the auctioneer either before or after an auction. Most auctioneers are familiar with applicable laws and are well versed in ethics and suggested business practices. Most are willing to explain general bidding procedures or why a particular bid is handled a certain way. If an auctioneer avoids questions or dodges those who seek them out, the bidder should exercise extra caution about doing business with that auction company. Auction companies want their bidders to return for other auctions and will work to earn that loyalty. Even so, bidders are ultimately held responsible for their commitments to buy, so they should familiarize themselves with essential auction basics. A good place to start is learning basic auction terminology so they can participate knowledgeably and avoid potential pitfalls. Buyers often think the auctioneer owns the items being sold but generally, the auctioneer is acting as an agent for a seller. Sellers hire auction companies to auction off everything from real estate to collectibles and they continue to own the items until the bidding on each item closes with a successful sale. The seller generally pays the auctioneer a commission on the sale of the property. How Does the Auction Company Offer the Items for Sale? At Carolina Auction & Realty, the auction process takes about thirty days, though real estate auctions may go a little faster. The company sets a date for the sale and advertises the auction online and puts out signage. Some companies may advertise in newspapers and multiple social media outlets. The auction company organizes the items for sale and prepares a listing or catalog of the items with descriptions. Item descriptions can range from general to highly specific. The more detailed descriptions can include things like make, model, dimensions, age, origin, and representations of working order or authenticity. Some include photographs of the item from different angles. Real estate auctions will include video. If the auctioneer makes no representation regarding an item’s condition or authenticity, that item is being offered as is where is or in its present condition. These terms mean the property is offered for sale without any warranties regarding condition, fitness for a particular use, or authenticity. For all property selling as is where is, it is the buyer’s responsibility to inspect and assess each item before bidding on it. Can Bidders Inspect the Sale Items Before the Auction? Potential bidders usually have the opportunity–and are encouraged–to inspect the items before the actual sale begins. This inspection is where the buyer does much of his or her due diligence. A thorough physical inspection helps the potential buyer determine the condition of each item and its authenticity. Unless the auctioneer makes specific representations about a particular item, it is up to the bidder—not the auctioneer or seller—to ascertain these things. How Do Bidders Get to Bid at an Auction? Only bidders who have bidding numbers will be permitted to bid on an item during an auction. To obtain this number, a bidder must register with the auction company and agree to applicable terms and conditions. The bidder uses this number for each bid. The auction company uses the bidder’s number to track purchases and prepare a bill for that bidder at the end of the auction. What Kinds of Things are Included in a User Agreement? Which state’s law controls any disputes. These agreements cover many other issues as well and the buyer should carefully review all terms and conditions before participating in bidding. Carolina Auction & Realty offers online auctions for personal property and realty. Online auctions grew out of the traditional auction industry and understanding general bidding practices helps potential buyers appreciate the simplicity of online bidding. Generally, auctions can be held in person, by telephone, online, even on television. For auctions run live by an auctioneer, an item will be offered for sale and the bidding commences. Once the first bid is acknowledged, the auctioneer will suggest the next bid. It is possible that only that first bid will come in and, if so, the auctioneer can sell the item after giving other bidders the chance to bid. Auctioneers suggest bids in increments. Some auction companies have predetermined incremental increases depending on how high the current bid has gone. For example, an auctioneer might use $5 increments for items bid at $50 or less ($30, $35, $40, $45, $50) then raise the incremental bid to $10 after the item reaches $50 ($60, $70, $80, $90, $100). The bids increments could rise to $25 once the bid reaches $100 ($125, $150, $175, $200) and keep climbing as the bid price reaches the predetermined levels. Some items will be listed and auctioned individually. But some might be offered in different ways. It is up to the buyer to recognize these differences and bid accordingly. Some might be bundled into a group that will be sold as one lot, e.g., six chairs sold as one lot might reach a final bid of $400 and the buyer must pay that amount plus taxes and other charges. Another way those chairs might be sold is by bid price times the number of pieces. In this situation, the buyer bids by the piece but is obligated to pay six times that bid. A final bid of $70, for example, would obligate the buyer to pay $70 x 6 or $420 plus taxes and other charges. Yet another way to offer such things is the ‘choice’ auction. Two or more items are offered to the bidders and the highest bidder gets to choose which one item in the group he or she wants. Once that buyer has selected that item, the auctioneer will reoffer the other items for sale. Where bidders are present, assistants called “ringers” help the auctioneer locate those attempting to bid. It is not unusual for an auctioneer to focus on the first two bidders to give them a chance at the item. When one drops out, additional bidders will be given the chance to join the bidding action. In some in-person auctions, telephone and online bidders compete directly with bidders sitting in the audience. Some bids come in, live, during the bidding and the auction assistant handling the phone calls or online bids will bid for those bidders. Other bids have been placed in advance and the auction company acts as a proxy for these bidders, raising the bid in the designated increments based on what a bidder has submitted. When it looks as though there are no more bids, the auctioneer will ask if anyone else wants to bid. When no further bids are forthcoming, the auctioneer will sell the item to the bidder with the last bid unless the item is being sold subject to a reserve price and the bid has not reached that amount. The high bidder will be given the opportunity to meet the reserve. Alternatively, the seller, if present, might decide to let the item go for the high bid, effectively removing the reserve. The fall of the gavel or designating the item as SOLD means the high bidder now owns the item and is obligated to pay the bid price, charges, and fees. Just as this bidder cannot withdraw the bid at this point, the seller no longer has the right to accept further bids, even if they are higher. In some auctions, the seller or members of his/her family may bid on many of the items. This can confuse some bidders who may suspect fraudulent or collusive practices are at work rather than honest absentee bidding. Many of these bidding practices are perfectly legal and appropriate, however. A reputable auctioneer won’t engage in dishonest practices and works hard to maintain that strong reputation. Those who allow themselves to be lured into dishonest practices usually don’t stay in business very long. Bidders should research auction companies before getting involved with a particular auction to ensure they are dealing with a reputable company. Buyers are often surprised to learn that they, too, have certain bidding obligations. They are not permitted to collude among themselves to keep prices down. It is not unusual for certain buyers to bid against each other on similar items. With active bidding by highly motivated buyers, the prices often rise quickly. Occasionally, such bidders have entered into an agreement to avoid competing for particular items. Bidders need to be aware that this is collusion and can constitute criminal fraud. Carolina Auction & Realty conducts online auctions. An online auction is simply an auction held on the internet with all bids entered remotely. Specialized software processes the bids in a fair and systematic manner similar to how a typical auction works. Before one can participate, a bidder must register, providing his or her name, address, phone number, email address, username, password, and credit card number. Once the auction company posts an auction catalog online, bidders can sit at home and bid on their computers or even bid on their smart phones while they’re out and about. They can enter a maximum bid and leave it to the software to continue bidding on their behalf in predetermined increments in response to other bidders submitting bids. When another bidder enters a higher maximum bid, that person becomes the winning bidder unless another bid, higher than that person’s maximum bid, is entered before the close of the auction. A bidder should be aware of a couple of things that can affect the timing of an online bid. First, when a bidder attempts to enter a bid for the first time in a particular auction, the software will present the terms and conditions for the bidder to acknowledge. Usually, this is a list of terms and the bidder must check each box then check the final box indicating agreement with the terms. This takes some time, so bidders will want to bid early enough in the process to get that out of the way. Some bidders have missed the chance to bid because they tried to bid at the last minute and were delayed by this process. Second, unlike some auction websites that permit sniping—those bids placed at the last second of the auction to prevent others from bidding further—auction company software typically eliminates this trick. Most auction company software includes a feature that automatically extends the auction for any item that receives a bid within three to five minutes of the scheduled closing time for that item’s sale. This gives others a chance to offer a higher bid. This mimics the traditional auction where the auctioneer continues to call for bids until there are no more forthcoming. An online auction typically lasts for one to three weeks. At Carolina Auction & Realty, an online auction lasts two weeks, beginning at 8:00 a.m. on Tuesday morning and ending two weeks later on Tuesday night at 8:00 p.m.
Each item to be sold is given an identifying number and photographed. The photos are then placed in an online catalog of the items offered for sale. The auction company will include one or more photographs of the item in the catalog and may include a brief description. At Carolina Auction & Realty, if the auctioneer is certain that an item is in good working order, that representation will be included in the description. Similarly, if he specifically knows a part is missing or that a collectible has a flaw, he will include that in the description. The descriptions for office equipment and refrigerators will include dimensions. At least five photographs of industrial equipment, including the tag plate, will accompany that item’s auction description. Some may have video that demonstrates they are in working order. Collectibles will have several photographs including multiple angles, markings, and any flaws. Real estate will have at least fifteen photographs plus video. If the description contains no representations regarding the item’s condition, that item is being sold as is where is. Any representations about condition or authenticity are limited to what is actually stated in the description. Though the auction is conducted online, bidders still have the opportunity to inspect the items. Carolina Auction & Realty offers the opportunity to inspect personal property on the Saturday before the auction closes. For industrial or business offerings, the inspection is held on a weekday close to the end of the auction period, during business hours. Residential houses are open for inspection on the Sunday before the auction. What if a Bidder Makes a Mistake? A bidder who mistakenly enters the wrong bid or bids on the wrong item should contact the auction company know right away. Most auctioneers understand that this happens and will undo that bid and give you the opportunity to rebid. When Does the Buyer Have to Remove the Auction Items? Terms of removal are stated either in the terms and conditions, user agreements, or auction catalog or accompanying information. Buyers are expected to remove the items on time. Because transactions are handled automatically in many auctions, the buyer’s credit card will have been charged already. A buyer who fails to remove the items may forfeit the item and could even be liable for additional costs that the seller or auction company incurs to remove the item. Some auction companies may bar the buyer from future auctions after two or more such occurrences.